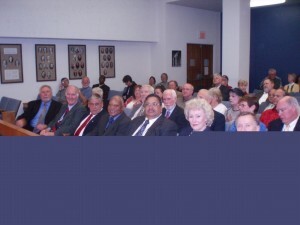 Phil Teran (third row, right, red shirt) served as a chaplain for this San Diego County Grand Jury. Pastor Phil Teran, member of South Pasadena (CA) Grace Brethren Church will be assisting the investigative division of the San Diego Medical Examiner’s office as a chaplain. He will do ride-alongs as requested and will be available to the staff as well as assisting with the Bereavement Center. Phil has been married to Colleen for forty years as of June 27 this year. He has two adult children, Jonathan and Jessica. Both children have their masters degrees in their respective fields, theology and communication disorders. Jonathan is married to Dr. Beth Teran (Physical Therapy) and Jessica is married to Dr. Chad Huebner (Pediatrics). Phil and Colleen are blessed with six grandchildren: Malia, Joseph, Kiana, Gracie, Jack, and Eva. Phil has pastored three churches over 38 years of ordained ministries including churches in West Covina, California; Columbus, Ohio; and San Diego, California. He has also taken Critical Incident Stress Management training and speaks Spanish, to help in translating at scenes. Phil served on the San Diego County Grand Jury for the 2009-2010 term. Simultaneously he served as their elected chaplain for the same time period. Phil was involved with the following committees: Chairman of Law and Justice, member of Health and Human Services, Editorial, Media, Complaint, chaired one Ad Hoc and participated in another Ad Hoc. According to Chaplain Joe Davis of the San Diego County Medical Examiner’s office, as a result of touring the County Medical Examiner’s Department (June 8, 2010) Phil was invited to be part of the Chaplaincy and Bereavement Center within the Examiner’s office. He has been cleared to accompany investigators and will perform memorial services through the Bereavement Center as assigned as well as being available to investigators and staff on Thursdays. Teran may be reached at philipteran@yahoo.com. Great opportunity for ministry. Happy for you Phil! !